For the growing number of people who weren’t born by 1996 you no longer need to blame your fetal (or pre-fetal) hands for not being able to grip a controller: Capcom are remaking their classic horror game Resident Evil. The remake will see a significant upgrade to the 90s visuals, Capcom assure us. “Using the latest resolution enhancement and 3D model technology, game resolutions and textures have been significantly upgraded, including 1080p support on next-gen consoles, resulting in characters and backgrounds coming to life in greater detail than ever seen before in Resident Evil,” the press release states. It’s more than the visuals that are seeing a do over. Resident Evil will now support surround sound and all the effects have been remastered. This should have a big impact on creating a sense of unease. Perhaps controversially, Capcom are introducing a new control scheme “where the character moves directly in the direction of the analogue stick,” as opposed to the old style of turning on the spot and then walking forwards. However, you can opt to use the original method if you’d like. 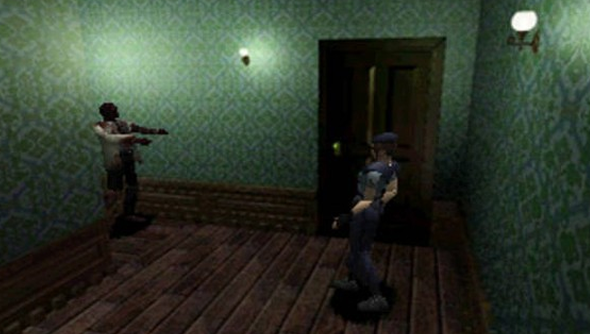 This isn’t the first time Resident Evil’s been remade. Back in 2002 Capcom updated the aged horror game for the Gamecube. Of course, officially, we have to deny such a creation exists. As with all consoles, console games, and the use of the word ‘console’. You can console assuage your mind, this will be the fanciest remake of them all.